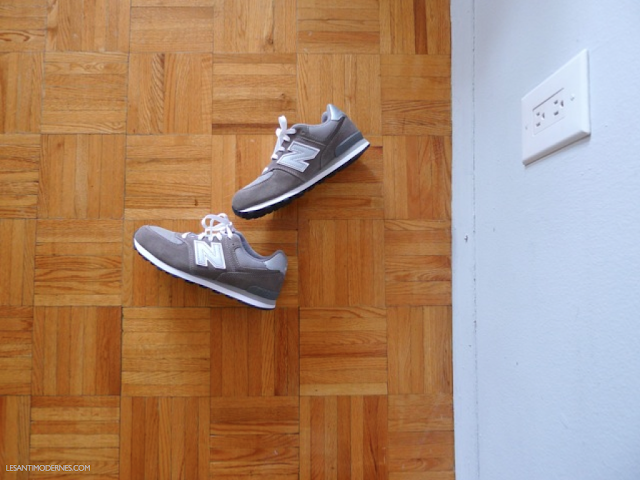 the theme of my 2014 so far: new year, new balances with everything. following my winter wardrobe post, i bought a pair of grey 574s (also loving this sleek vintage version, here and here). in spite of their ever so Rick Steves/high school science teacher vibe, they're actually more elegantly versatile in person. bonus: these offer the most cushiony arch support of any sneaker i've tried (with the exception of my super clunky gym-only running shoes). the more neutral/monochrome the colorway, the better. lo-tops are almost universally flattering. 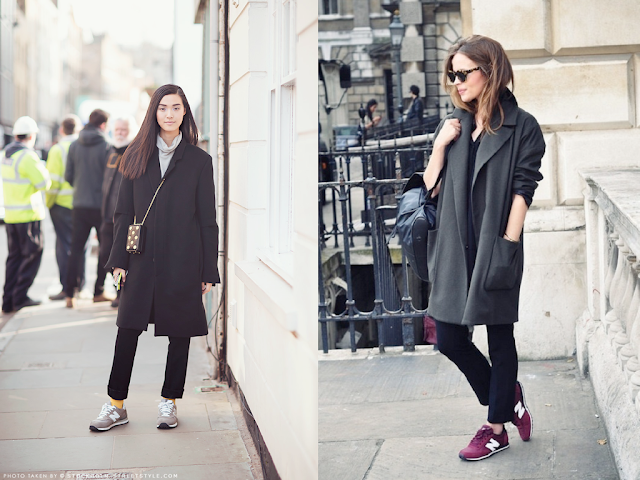 hi-tops are trickier to style depending on your height / proportions. shop the boys' section (go 1.5 sizes down from your regular size) if you're on the smaller end of women's sizes. the styles are the same, and you can often score sold-out styles for less – double win! what do you think of NBs? do you have a favorite? I seem to be building a wardrobe of Nike Air Maxes, which are the spiritual twin of NBs. Two pairs so far. And I just wish the weather was better here so I could wear them more often. I agree that the more neutral the tones the easier they are to style. Yours look good and will work well with going into the warmer months because of the lighter grey. I recently wore my New Balances after the snow and my bf was like WTF are those. They totally look chic on the right person, but guess I can't pull it off, hah! i'm really liking the sneaker trend (rick steeves style, FTW!). i'm partial to my nike flyknit trainers, but have had new balances on my mind lately. Not NBs, but I bought a pair of Nike 'vintage' waffle trainers that were released by JCrew last year and love them! They're red, so not neutral, but they look great with all-black outfits so it works out. If I were to get another pair of cool sneakers it would definitely be NB. The photo on the right inspired me to get a pair of burgundy NB 410s! I tried on the 574s, but found they made my size 9 feet look too big and chunky. The 410s have a lower profile and are super comfortable! I followed those up with bright blue 420s for something more sporty, and am now considering classic white and black shell toe Adidas. I just got my grey ballistic 501s today! I'm also really attracted to the 420's which seem to have a bit of a sleeker profile. Converse (I own a pair in camo print) and Lanvin satin sneakers (so chic, and that leather lining is super soft). But that's enough sneakers for the moment! Not NBs but to build on the advice to raid the kids section - I raid the boys shoes of Target for pseudo-Vans skater slip ons - my favorite so far are a camo print pair I got over the summer. How do these fit if you order from ASOS? Do you get the regular US size? I've been searching for the 410's, in black. Seems they're sold out everywhere. They look like the sleekest NB profile to me. Thanks for the links - I am now stalking the j. crew NB tennies. I had been eying this trend and added them to my wishlist after I read your article, and I scored a pair of 420s on super sale (50$ and I had a gift card at the Bay in Canada)! I love their sleeker profile but they look very true to the 574s style. Thanks again I love your essentials features keep them coming. I've got my eyes on a pair of black 410, with a pop of neon red and turquoise on them. Sounds insane, but they feel fairly neutral to me, ha! They had them at a local store before I went away for the holidays, so now I'm just keeping my fingers crossed that they're still around.